This post is Part 4 in a series of weekly posts I’ll be doing on the process of sweater knitting: not exactly the nitty gritty details and techniques, but the opportunities and decisions you may encounter on the way to getting a knitted sweater that works for you. Previously, the topic was yarn selection and substitution. So, you’re knitting a sweater. Let’s say for the sake of argument that you’ve done everything an ideal knitter would do up until this point: You’ve gone through a considerate process of selecting a pattern that you know will work for you and your sweater-wearing lifestyle needs; You’ve measured your body and considered what kind of fit and ease you want from the sweater and have chosen your pattern size (and style) accordingly; You’ve chosen a yarn that will work for the pattern in a colour that pleases you; You’ve even knitted and washed a gauge swatch (or possibly more than one) to make sure you’re knitting at the gauge you need…Now you can go right ahead and cast on and start the sweater, right? Right! Well, more accurately, you could go ahead and do that. In fact, a lot of knitters would probably do that before doing any of those other things. You may have even been that knitter in the past. You might have been that knitter just this morning. In fact, there is really very little that is required of you in knitting – you need to use yarn and knitting needles, but that’s sort of it as far as hard-and-fast rules. You’re free to make changes on the fly if you think it will improve the final result, you can rip it all out and change to another pattern if you feel like it, or you can just knit blythely along and not change anything from the instructions at all and just see how it goes. If you want to make sure you have a handle on everything you’re going to be doing to make this sweater, though, you should do that thing that most patterns put up towards the beginning of the pattern/magazine/book notes: “Read through entire pattern instructions first before casting on.” It’s the knitter’s version of RTFM (here, have the XKCD comic version, too), and if you’re feeling a little worried right now about having neglected this instruction in the past, don’t worry – you’re neither the first or last knitter to have skipped that step. I probably did it twice just last week. It’s also sometimes a matter of what level of experience you’re at, or familiarity with the kind of project, or confidence or willingness to just see what happens as you go that affects whether a knitter will actually follow that step. But you know, there’s just no harm at all in actually doing it, and it might even save you a few moments of confusion later on. When they say ‘read through all instructions first’, don’t forget about all the pieces of information on the front page. You can generally count on a project description, materials list, gauge estimation, and possibly even a list of required skills to be printed even before you’ve flipped to the second page of the pattern. The project description may indicate things about the style, intended fit or amount of ease, and the method of construction (top-down, bottom-up, seamless, sideways, etc), although this will certainly vary widely between patterns. Patterns produced by large, mainstream publishers will also often indicate a skills rating – easy, beginner, intermediate, advanced, and so forth. These categories also have some depth and breadth to them, and can feel a bit random sometimes, often because certain techniques are judged to have skills ratings on their own. For example, if a project has seams or cables, it is more likely to be charged as an intermediate pattern, but I could hold up a wide variety of patterns that qualify both as seamed garments and cabled garments, so I personally recommend ignoring the categorical rating and focusing instead on the individual skills required for the garment, and your comfort level of trying them out for the first time on that particular project if you haven’t done them before. The materials will tell you things you want to know about the yarn, for sure, and most of our attention tends to go to this part of the materials list first. It’s what we’re spending most of our money on and it’s the part of this whole endeavour that can make or break a successful pattern – poor yarn choice can result in a garment that gets resigned to the back of the closet, or ripped out only to be returned to yarn state and re-knit into something else. However, the rest of the materials list can also tell you a lot about what is going to happen in the process of making the pattern. If a skills list is not provided, reviewing your materials list and the pattern instructions can help you with this. Consider what each of these materials are likely to be used for. If it calls for buttons, then you can anticipate having to work some kind of buttonholes during the knitting or finishing process. If it calls for a tapestry needle, you can expect to work some kind of seams, or possibly kitchener stitch for grafting under-arms or joined collars at the back of the neck. If stitch markers are on the list, that likely means you’ll be working with differentiated stitch repeats that need some markers to help you keep things straight; or, it could be a sweater that joins to work seamlessly at a raglan or circular yoke, and stitch markers are needed to differentiate the sleeves from the body. 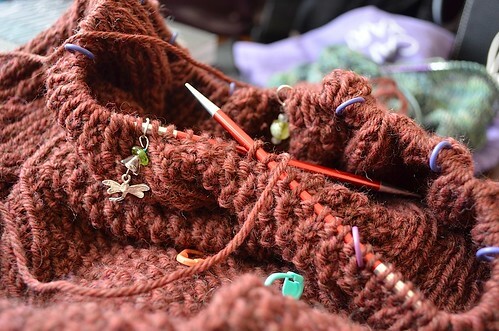 If waste yarn or stitch holders are included, then you can anticipate having to put stitches aside at some point – perhaps for the under-arm of a sleeve on a seamless sweater, or for a three-needle bind-off for a sweater shoulder, or for the centre of the scoop-neck of a pullover. (Other popular occasions for this include the thumb gusset of gloves or mittens). And finally, if it calls for a crochet hook, you can expect some kind of crochet work at some point, most likely in the finishing stage for edges or embellishment. In general, what you want to be looking out for when you read the pattern instructions is how it is constructed and what kind of steps will be involved in achieving that construction. Also, what kinds of techniques you will need to do. Is there waist shaping involved? Do you need to measure yourself to make sure the waist shaping will meet you at the right spot, or would some adjustment in length be desirable/possible? Check to make sure you know what size you’re making, and take a pencil or highlighter (perhaps on a for-personal-use photocopy of the pattern if necessary), and underline or circle your own size notes at the part where various stitch counts or pattern repeats are given for multiple sizes at once – a la S(M, L, XL, 2XL) or similar. Does the pattern refer to charted stitch patterns? Double-check them to make sure you’re familiar with the notations the charts use, and refer to the glossary as a reminder. How many words does the pattern devote to the instructions? A lot of printed publications aim to reduce the amount of page space taken up by a pattern, to keep the page count down and therefore keep printing costs down. Sometimes this results in them shortening everything. Not just K instead of knit, but “st st” instead of stockinette stitch, “g st” instead of garter stitch, “EOR” instead of end of row, and so on. Are there any abbreviations in the pattern glossary that you’re not familiar with? A lot of self-published patterns that are sold online are likely to have more wording and overall information in their written instructions (because they are limited only by what they can put into a PDF file, not a printed page), however the bare truth of the matter is that style varies greatly between designers and between publishers. Every so often you may just happen upon an instruction that isn’t worded as clearly as you would like, and this is when a solid reference manual or helpful knitter friend can be useful. The other key piece of info to at least glance at – if for no other reason than to see if it exists – is the pattern schematic. The pattern schematic will hint at the shape and style of the garment, and give you at least a minimal amount of measurement information at a glance. Most schematics will indicate length, bust circumference, sleeve length, armhole depth, and shoulder width, but many will also go as far as to tell you sleeve cap depth, wrist circumference, length from waist to hem or from waist to collar/back of neck, and more. The photographs should also at least hint at this kind of shaping and fit as well, and you can judge for yourself based on your own measurements and body knowledge if this could be modified to fit you better. If there isn’t a schematic, some of this information can usually be deduced from the written instructions. 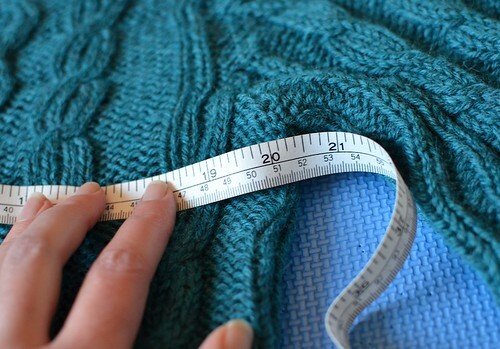 If you are working from the bottom-up, it will tell you how long to knit for until breaking to work the armholes, and that will indicate length measurement from the hem to under-arms, for example. Again, schematic information does vary a great deal, so your mileage here may vary. As far as techniques, you’ll be able to tell from reading through the instructions if you need to work increases and decreases for shaping, if charted instructions are required, and so on. Don’t be too intimidated if there are techniques or steps you haven’t done yet. You have to start somewhere. 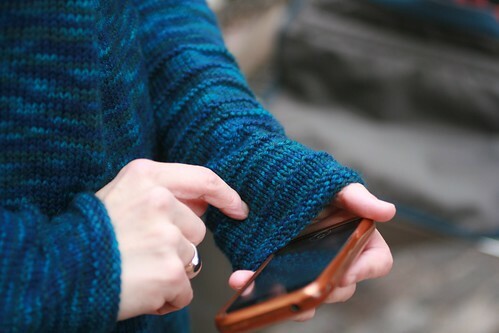 If you’re knitting a sweater with cables but haven’t done cables before, well, there is just no rule anywhere against that. Dive in if that is the cabled thing you want to work on. It IS true that the technique you haven’t tried yet has the potential to trip you up more so than familiar knitting steps, and you might well have to rip out and re-knit something along the way, but that’s not really a reason not to try it. The best time to have a look through the pattern instructions is to discover if or how much to modify the instructions to fit your size and style. A great deal about size and fit can be customized by modifying existing patterns, and very often only a few things. This will be the subject of next week’s post in this series! Charts Made Simple, by JC Briar – for knitters who struggle with working from charted patterns, or need help learning how to do this effectively. Knitspeak, by Andrea Berman Price – a guide to all the little glossary terms and knitting idiosyncracies that make up pattern notes and knitting language. This is a really fun pocket-sized guide. The Secret Language of Knitters by Mary Beth Temple – a humorous guide to knitspeak that includes not just jargon but vernacular like “design element” (mistake that became a garment feature), and so forth. Meditations for Women Who Knit Too Much, by Stephanie Pearl-McPhee – if you want to learn a bit about knitting technique and the struggles we all encounter, and laugh at yourself at the same time. Principles of Knitting, by June Hemmons Hiatt – the last reference manual any knitter may ever need, because it is so comprehensive about everything from swatching to buttonholes to finishing techniques. For reference use more so than bedtime reading. (Heh). If possible, I always try and read the pattern before I purchase yarn. I like to know what I’m getting in to before I make that commitment. Very good advice. I just read through your series. I posted a 2 part blog on the same subject, but mine does not have nearly the depth as yours. Happy knitting! I would add: use a highlighter pen to mark your size and any instructions given specifically for your size. Also, look for and mark the dreaded words “And at the same time”. I also write out a list of row numbers where decreases/increases will be happening and cross them out as I go. Another phrase to look out for is ‘Reverse the shaping’. I hate it when this is used in a pattern that would otherwise be simple for a beginner. A pattern schematic is one of the pieces of a pattern I look for most and one that tends to be left out of less thorough or more space-limited publications. The best advice I’ve seen for this lack is to draw one up yourself! It may take time, but it’s especially useful if you think you might want to make modifications. Sometimes photos are misleading: a pattern has more or less shaping than the modeling suggests, or full sleeves have been scrunched up and look shorter than they are. Referring to a schematic (along with the photos) can also help sorting out tricky pattern instructions, like figuring where a piece is attached or why you’re told to pick up stitches or put them on a holder at a certain spot. Thanks for another great installment, Glenna. Your series is the highlight of my internet browsing week. This is a great post! So much great advice! I’ve knit some sweaters in my day but I am always yelling at myself to read the pattern before I get started. (I like to read it while I work on my swatch! I feel as though I’m on my way without I get a chance to screw something up!) I’m the same way with baking. I always jump in before reading the recipe. I make movies. I’d never start shooting a scene without reading the script. How would I know what should be a close up or a tracking shot? That’s how I always think about it. Awesome posts and advice ….I so appreciate it. I have to admit to reading all my patterns and especially sweaters because I usually have to adapt them to my body. This entire series has been highly informative and helpful and had me pull pull out sweater patterns and really start thinking about what to work on next. Maybe I missed this advice in an earlier installment in the series but an important part of choosing and reading over a pattern is checking for errata.